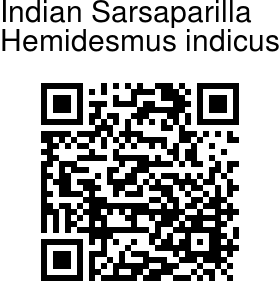 Indian Sarsaparilla is a vine, which trails on the ground and climbs by means of tendrils growing in pairs from the petioles of the alternate, orbicular to ovate, evergreen leaves. The vine emerges from a long, tuberous rootstock, and can reach up to 1-3 m. The hindi name Anantamool literally means, endless root. The small, greenish flowers grow in auxiliary umbels. The flower cymes are stalkless. 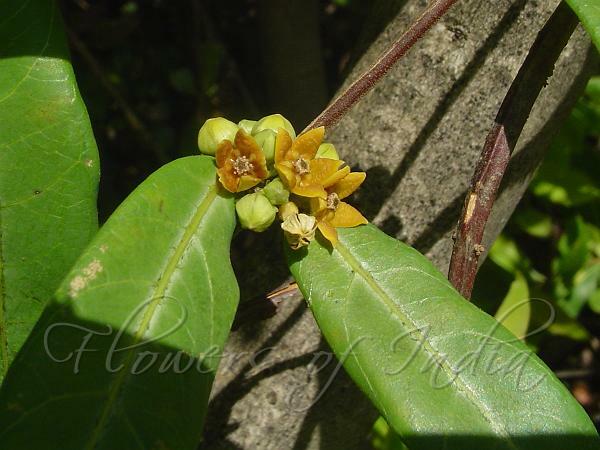 Flowers have 5 petals, greenish on the outside and purple to yellowish orange on the inside. The flower petals are fleshy, typical of the Milkweed family to which it belongs. Now the Milkweed family has been incorporated in the Oleander family. Flowering: October-January. Medicinal uses: It is one of the Rasayana plants of Ayurveda, as it is anabolic in its effect. It is used for venereal diseases, herpes, skin diseases, arthritis, rheumatism, gout, epilepsy, insanity, chronic nervous diseases, abdominal distention, intestinal gas, debility, impotence and turbid urine.